At the heart of jump racing is 'The FestivalTM, which has become the shining jewel in the racing calendar; a date that coincides with St. Patrick's day and sees the Republic of Ireland flock to Gloucestershire.Head Groudsman Ben Hastie is responsible for keeping the course in pristine condition to welcome more than 700,000 visitors per year. The first organised Flat race meeting in Cheltenham took place in 1815 on Nottingham Hill, with the first races on Cleeve Hill in August 1818. Racing's popularity soared over the next decade with crowds of 30,000 visiting the racecourse for its annual two day July meeting featuring the Gold Cup, a three mile flat race. In 1829, Cheltenham's Parish Priest, Reverend Francis Close, preached the evils of horseracing and aroused such strong feeling amongst his congregation that the race meeting in 1830 was disrupted. Before the following year's meeting the grandstand was burnt to the ground! To overcome this violent opposition, the racecourse was moved to Prestbury Park, its current venue, in 1831. Steeplechasing became established in nearby Andoversford from 1834 and moved to the present course in 1898. In 1964, Racecourse Holdings Trust (now Jockey Club Racecourses) was formed to secure the future of Cheltenham. The group now owns thirteen other racecourses - a combination of jump, flat, dual purpose and all weather. Wholly owned in a trust by The Jockey Club, profits are invested back into all fourteen racecourses to ensure the continued success and development of British horseracing. The stands changed little between the 1930s and 1950s when the National Hunt Steeplechase course ran behind the back of the stands. The original Tattersalls Grandstand was opened in 1960 to cope with growing crowds. The Weighing Room was underneath the Festival Restaurant and the Winners Enclosure above the Parade Ring. During this period, the centre of the racecourse was developed and became a popular raceday enclosure. The main Grandstand was completed in 1979 and extended twice in the 1980s. The top two levels were dedicated entirely to private hospitality, and in 1982 the Parade Ring, Weighing Room and Hurdlers Hall were built behind the stands with terraced viewing for 4,000. 1997, the original Tattersalls Grandstand was knocked down and replaced with tiered viewing and the Panoramic Restaurant which boasts spectacular views across the racecourse. During 2003-2004, £3m was invested in the Best Mate Enclosure in the centre of the racecourse, giving a new grandstand and arguably one of the best views of racing. During the same period, £17m was invested in providing additional raceday facilities with The Centaur, a new conference and events centre. Accommodating up to 4,000 visitors, The Centaur is the biggest venue of its kind between Birmingham and Bournemouth. In 2005, The Festival was successfully extended to four days. 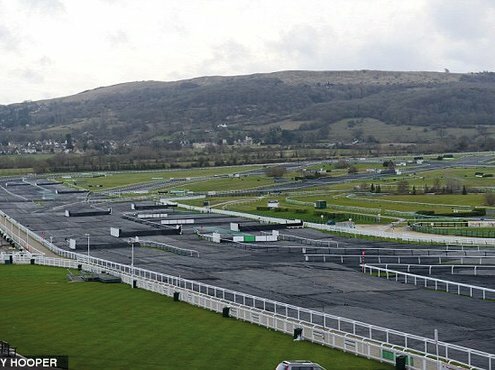 Cheltenham completed a £45million redevelopment of the course, in November 2015 and employs more than 80 permanent staff, which rises to approximately 1,000 for a race meeting and more than five thousand for The Festival. It is worth an estimated £100m to the local economy and hosts the largest tented village of any kind at a sporting event. The racecourse is also home to many other organisations and businesses, including Cotswold RDA, Cheltenham Archery and clubs for angling and model aircraft. 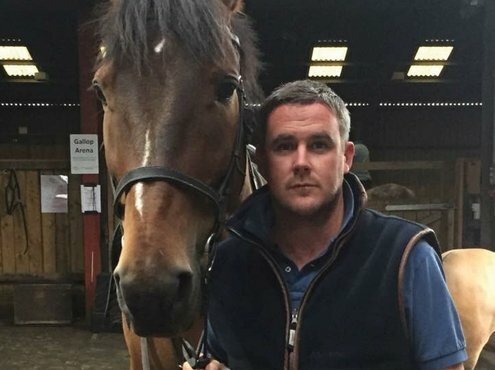 At the heart of the racecourse is Head Groundsman, Ben Hastie who answered the following questions to give us an insight into life at Cheltenham. I started in turf management immediately after leaving school at Cherwell Edge Golf Club near Banbury. I worked my way through NVQs, on a day release scheme at Moreton Morell College, and then moved to Kirtlington Golf Club where I stayed for three years before accepting the position of Groundsman at Cheltenham Racecourse. I have NVQ 1,2 & 3 in Sportsturf Management, PA1, 2 & 6 spraying certificates, chainsaw certificate, Intermediate & Advanced Racecourse Management, Loadall certificate and first aid. I would say Gary Armstrong who was my first boss at Cherwell Edge and gave me my first start. He was hard but fair and I learnt a huge amount from him. My immediate boss is Simon Claisse who is Clerk of the Course and, between us, we work out what we need and how much we can afford. We are very lucky to have a healthy budget here at Cheltenham. 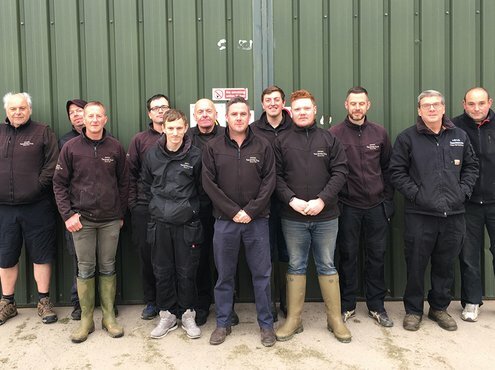 I have eleven staff with a variety of lengths of service ranging from seven months to our fence builder who has been here thirty-five years. Age-wise we range from twenty to sixty-four. What additional help to you get? We have a few casuals we can call on when we need extra help such as before big meetings. Steve Gingell from the STRI is our agronomist who comes in quarterly and is a big help. How would you describe the soil profile? The soil profile is predominantly clay with a nice top layer of soil/sand mix. 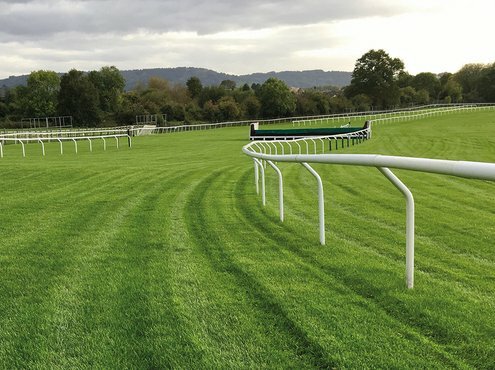 This is good for us as it gives the track a nice solid base, but also the top section gives a nice cushion for the horses and the grass plant thrives on it. Does it require any special maintenance techniques? We vertidrain all three courses in the off season (May to October) to depths varying between 12-16 inches and we also scarify using a Koro® FieldTopMaker®. This has helped us to rid the course of any rogue grasses we don't want, such as bents, as we are looking for a mainly ryegrass track We have found that ryegrass is perfect for racing as it copes well in cold conditions, it's very disease resistant, quick germinating and has a high wear tolerance. Do you have any additional equipment/systems at your disposal - for example, undersoil heating, drainage, lighting rigs, covers? The drainage here at Cheltenham is some of the best in the land and we have extensive drains all around the track. Every year we work on areas that may need a little extra help or areas where the drains need replacing. 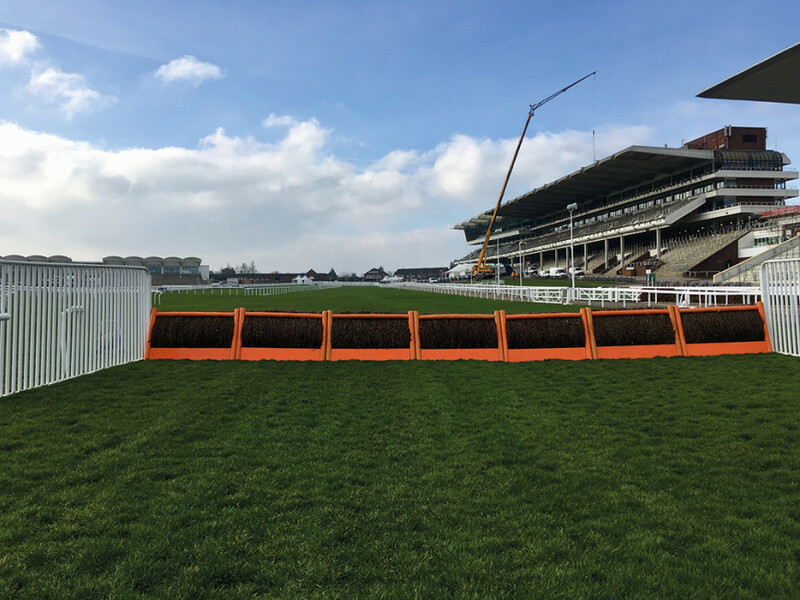 Because our racing season is in the winter, frost can be a huge problem, so we have forty of our own frost covers which we can deploy to vulnerable areas around the course, such as the landing side of fences and worn areas. This generally will protect us to -5° but, things such as wind-chill also can have an impact. We sometimes have to cover the whole track with frost sheets which is done by a contractor called Sports Stadia They will lay roughly 400 sheets on one track alone which can take forty guys up to six hours and then they also have to get them off on the day of racing This in itself can be high pressure as they may only have three hours to remove them depending on how quickly temperatures rise. The whole site at Cheltenham is around 350 acres. We look after everything that 'grows' in effect as well as setting the course up for racing. This includes being responsible for the parade ring, lawn area, trees, shrubs and hedges and also car parks which are a big area of the site. The actual racecourse is roughly 75 acres of racing surface. Does the course suffer from any regular natural occurrences such as flooding, high winds, excessive snowfall/frosts etc? In 2007, we were hit hard with the flooding that engulfed Gloucestershire but, luckily for us, that was in July so it didn't interfere with our racing season. However, as I've said our drainage is second to none so we are very lucky we don't get affected by flooding hardly at all. Are there any issues with shade and air flow? The actual racing surface isn't affected by shade or air flow as it is a very open space here. Sometimes, we can have our own little microclimate where the weather changes as it comes over Cleeve Hill and down into the bowl that the racecourse sits in. The parade ring and winners enclosure can suffer due to the stands and the position of the sun from time to time. Obviously, the sun being lower in winter can sometimes hinder recovery in these areas. Are there any artificial surfaces at your facility? From the stables to the track the racehorses will walk on a rubber surface which is a high specification equestrian rubber. The unsaddling enclosure, where all horses who finish out of the top four will unsaddle and cool down, is an artificial grass type material. This is due to the fact you can have up to twenty-two horses being cooled down with water and we soon found a turfed area got quite messy and muddy. The artificial grass has stopped all these issues and is very hard-wearing. During the racing season, we will mow at between 4½" (114.3mm) and 5½" (127mm). This gives us that extra bit of cushioning for the horses and also helps with recovery as the plant is at a mature stage at that height. We use John Deere 1600 WAM's for cutting the course and this can take two guys two days to cut the whole track. They then move onto infields and car parks and start the cycle again! We also have smaller John Deere mowers to do other areas and lawns etc. In the parade ring, we use a Dennis cylinder mower which is an exceptional piece of kit and the area has improved greatly since we moved to this mower. Overseeding is done after scarifying in the summer months using a mixture of Limagrain MM60 and Johnsons J4 Turf. Together, these species give me the quality I'm looking for. As and when required, we will apply granular fertiliser. We use a 15:5:20 + 2Mg0, which we find works best for here, and the response is quick and the results are amazing. During the winter months, we will apply liquid iron again as and when needed. Every member of staff has different strengths and weaknesses and I think you have to play to everyone's strengths to get the best from the team and also the best for the racecourse. My fence builders, Keith and John, generally stay on the fences all year as it is quite a bespoke job and they have many years of experience which match the high standards required. Tim, my assistant, looks after the parade ring; again to the high standard we require. I have a guy who loves looking after plants etc., so it makes sense to use everyone's strengths to my advantage. Having said that, everybody does get to do a whole variety of jobs around the site which I also feel is important for them and their work enjoyment. Presentation is one of my favourite words and it really is key. We have up to a 700,000 visitors a year here, who could be coming racing, to watch a show or coming to a party, and I feel everyone of those people should have the same thought when they leave which is 'Cheltenham looked amazing'. Are renovations affected by outside pressures? 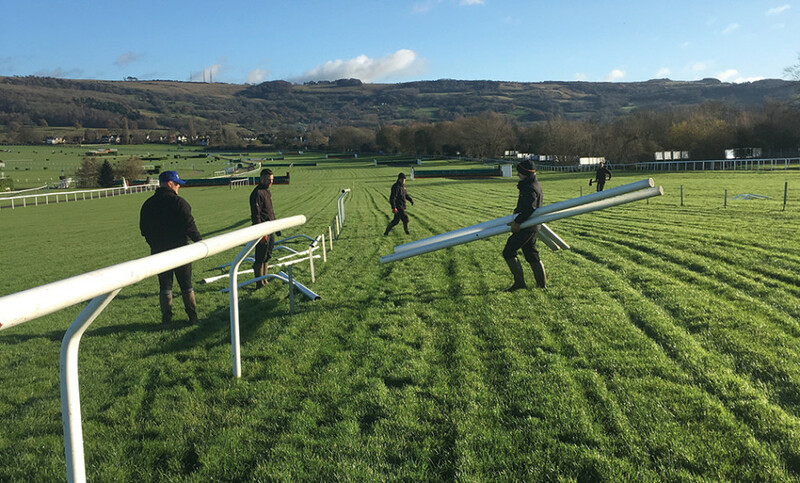 The racecourse always comes first so any events, concerts etc will be organised around what is going on out on the track. In my eyes, I think the seasons are changing slowly. The winter period now seems to be from December to March which means everything seems to be a month out from where you would have seen it ten years ago, but you have to adapt to change. After the season, we will be undertaking drainage projects in a few areas which will be carried out by DW Clark Drainage. All of my staff are encouraged to take as much training as they can and everyone of them will go off and do different training such as PA's and chainsaw course etc. 80% of my staff are first aid trained. How do you purchase machinery - e.g. outright, five year replacement deal, second-hand etc? A bit of everything really. Most of our kit is on a lease deal but we also buy direct. We have a deal with John Deere for most of our kit as you can probably tell from the kit list shown on the left. Are you loyal to one manufacturer, where possible? Mainly John Deere for most kit, but we do use other manufacturers. Who carries out your servicing? We are part of a service agreement from John Deere called Powerguard, where each bit of kit is under warranty, and we do the small services and checks. John Deere will come in and do the big services and any other repairs. How important do you consider the local flora and fauna? We try to be as environmentally friendly as we can be and we will leave areas unmowed in the out season and sown with a wildflower mix. Hedges are left to flourish for birds and wildlife to live in. This summer, we will be looking at more bird boxes around the site as well as more meadow areas. 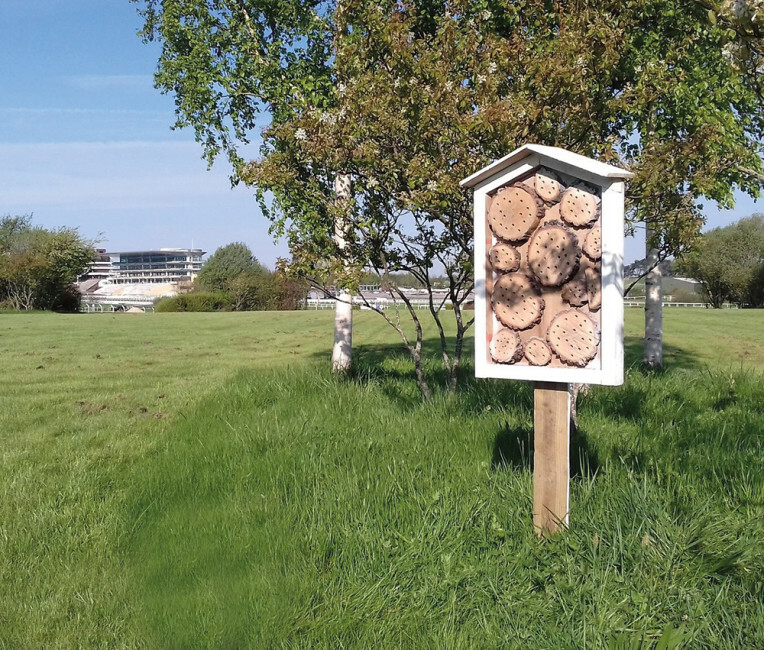 As well as that, we have installed 'bee hotels' in quieter areas of the course, as bees are so important.